Apparently, no such thing exists…yet. There are reasonable facsimiles, however and so I have been visiting salons and stores, both online and in person, asking for advice and samples. By the way–I need to state upfront that I am on my own for this sampling. No one is seeking me out to try their products and speak for them. This is my nickel. My first product of interest was the Jane Iredale skin care and cosmetic line. I see this product advertised in Vogue, Bazaar and InStyle as well as at Dermatolgy Doc Offices. I pulled up the website and began to search for shops in my area that carried this product. Last Friday, I found my way into a small nail and skin spa called Originails. [For you local folks, this is in Hales Corners]. An extremely pleasant clinician unhurriedly answered all my queries regarding the Jane Iredale skin care/makeup line. While there, I noticed Dermalogica and made ample inquiries about this line of products as well.Their store had recently held a Mom’s Day bash which pretty much depleted their sample stock. Nevertheless, she doggedly searched every drawer and cabinet until she found a few gems. The Jane Iredale sample is mascara and lash primer–I have not used these yet as I am still healing my stye. The Dermalogica sample is a skin perfect primer with an spf of 30. I have been using the primer all week in place of my serum and primer. It has a slight tint and appears to have a lot of mineral in it, yet it goes on soft as silk. I can’t say that I’ve noticed anything really different in my skin in the last week. I will finish the sample package and let you know next week if I have anything of value to report! Before I left, my clinician encouraged me to make an appointment for a skin consult later this summer. I may opt do that. Much of the research I did after this visit was of the Google variety, leading me to dead ends, non-functioning websites, or products that left me feeling less than willing to try them out. My skin consultant really believes in the product and has glowing healthy skin–she also loves her job! After my facial, she handed me a mirror and I was stunned at the radiant face smiling back at me. I did buy a couple of products that I felt could work into both my current stash and my routine. My new best skin care friend made notes and started a record for me but did not push me to purchase anything I was not comfortable with at this time. I do not like to waste anything. Since I have a rather sufficient stock of cosmetics, Autumn will be the next time for purchasing foundation, concealer, lipstick, and shadow. All creams and serums will be used until empty as well. 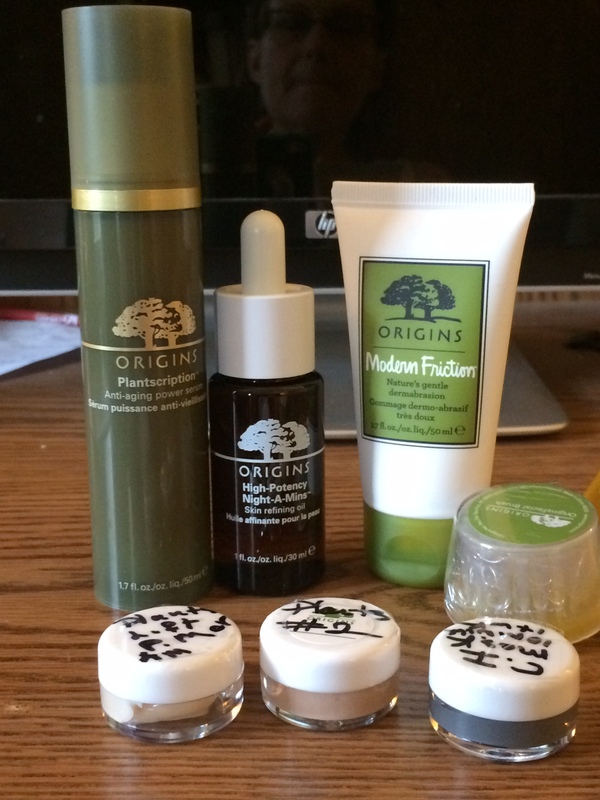 The Origins anti-aging power serum and High Potency Night skin oil will find their way into my routine shortly. The Modern Friction dermabrasion sample is a different means of exfoliation for me but I am anxious to try this out as well. I shall finish the Dermalogica primer and monitor the results, if any. You know what they say…put on a happy face!